IBA CEIF and Meezan Bank jointly present an advanced level course on Treasury Management for Islamic Banks. Treasury operations contribute a sizable portion of income to any financial institution. 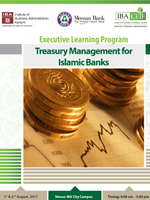 Keeping the Shariah requirements intact while facilitating treasury operations smoothly, makes this course a must take for all those interested in the Islamic Treasury Products. This course shall enable the participants to gain valuable insights into the Shariah requirements and modes being employed by Islamic Treasuries.